I genuinely respect you, Mike Rowe. I love all the shows you produce, and I greatly admire the work you do with your foundation. But I can NOT in good conscience watch ANYTHING endorsed by the deeply DESPICABLE Mike Huckabee! Mike Huckabee is right-wing NUTJOB out to destroy the very people you want to help!! And TBN is no better!! They prey on the WEAK and GULLIABLE! I’m very sorry, but I have NO CHOICE but to UNFOLLOW you and your page!!! I can see from those caps and exclamation points that you’re genuinely distraught by my proximity to someone you don’t like. Likewise, finding out that I sold a TV show to an outlet that’s not on your list of approved networks had to be traumatic. However – if I’m not yet banished from your news feed, I have a parting question for you – Why are you so upset? Somebody’s Gotta Do It is a non-religious, non-partisan, family friendly show. Like Dirty Jobs, it celebrates the kind of Americans I most admire – hardworking, passionate, ambitious individuals who make our country a better place. Isn’t this the sort of content you’d like to see more of? I get that you despise TBN. I get that you despise Mike Huckabee. But given your affection for me, your fondness for the shows I produce, and your admiration for my charitable work – I would think you’d want my message to reach as many people as possible. Well, TBN reaches 98% of the country. Wouldn’t you like their audience to see Somebody’s Gotta Do It? Moreover, wouldn’t you like to TBN to purchase more shows like this, and maybe evolve into the kind of network you don’t despise? Here’s the thing, Carsen – I don’t have my own network, or my own channel. I make the programs I like, and hope someone buys them. Friends of this page might recall the dust-up that occurred three years ago when I first sold Somebody’s Gotta Do It to CNN. I was nervous about the association, because I knew a light-hearted program on a cable news channel was subject to preemption. But CNN was offering an hour in primetime, and more importantly, the freedom to do the show I wanted to do. So we made a deal. Unfortunately, right after the premiere, an avalanche of breaking news – along with the most contentious election in recent memory – led to a rash of preemptions, making it virtually impossible for anyone to find the show. But there was another problem. When the promos started airing, thousands of my virtual friends flocked to this page to tell me they couldn’t watch anything on CNN. Their consciences, you see, simply wouldn’t allow it. And so, with the caps lock button firmly engaged, these highly principled people made sure I understood just how much they liked me – moments before announcing, (usually with great sadness and a flurry exclamation points,) that we could no longer be friends. I have no wish to come between you and your conscience. I won’t beg you to stay, or remind you to watch Somebody’s Gotta Do It, (Saturday’s on TBN, right after Huckabee!) But I will tell you this: I didn’t make Dirty Jobs for Discovery; I made it for my grandfather. And I didn’t make Somebody’s Gotta Do It for TBN; I made it for viewers who enjoy watching real people doing something worthwhile. That’s the truth. If your conscience forbids you from watching simply because it’s on a network you don’t like, I completely understand. But if you’re telling me we can’t be friends, simply because Mike Huckabee invited his fans to watch my show while I was standing next to him, then I’m going to suggest that maybe – just maybe – you might not like me as much as you say. If I’m wrong, you’ll be pleased to know that Facebook has ordered a second season of Returning the Favor. In fact, you can check out our Christmas Special on this very page, December 19th. (Yes, it’s listed as a “Holiday Special,” but I prefer to call it what it is.) If that’s too offensive, Discovery still airs Dirty Jobs five times a week, usually on Saturday mornings. If that’s too disgusting, The Way I Heard It can still be enjoyed at mikerowe.com/podcast. 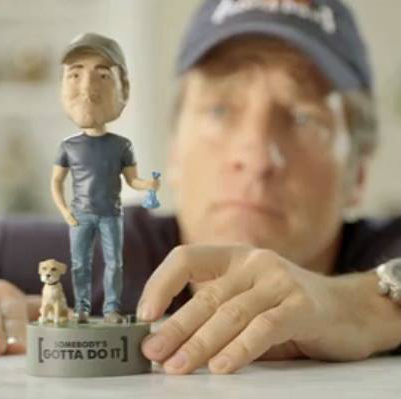 And finally, if your Naughty List precludes all Mike Rowe entertainment options, perhaps you’d like to support my foundation – (the one you “greatly admire,”) with the modest purchase of a genuine Mike Rowe Talking Bobble Head! Either way, Carsen, you’re welcome back here whenever your conscious permits. We’ll leave the light on for you.